This is a wonderful time of year, it's Spring and when there is rain, there will be green grass, budding trees and beautiful flowers. I wanted to do a fun and different kind of page for this topic today. You know me, I can't ever go with the expected lol. 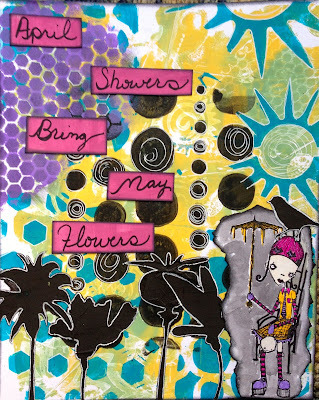 Artful Times Challenge Blog - Their theme this week is "Use Your Stencils and/or Masks"
Stampotique Designers Challenge Blog - Their theme this week is "April Showers Bring May Flowers"
Before I begin a page I like to go through my bag of Gelli Prints and see if anything catches my eye for the page. I have decided to use this print. 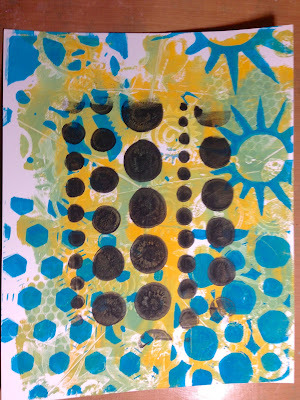 I made this print with acrylic paint and a ton of Crafters Workshop, Dina Wakley and Dyan Reaveley stencils and my trusty Gelli Plate. I really like this print and I wanted to add some other color to it. I used a stencil and some Claudine Hellmuth purple paint to add to the upper corner. I also added some black distress ink on top of it with the same stencil and then I went around some of them with my white gel pen. I also added some doodling to the black circles with the white gel pen as well. After that I wanted to add some funky flowers to the bottom so I got out my Wendy Vecchi black embossing paste and used a stencil to put some flowers. This is the first time I have ever used this paste and I have to say, IT IS AWESOME! It's unlike any other paste I have used and I am now going to buy the other colors. I love this stuff. 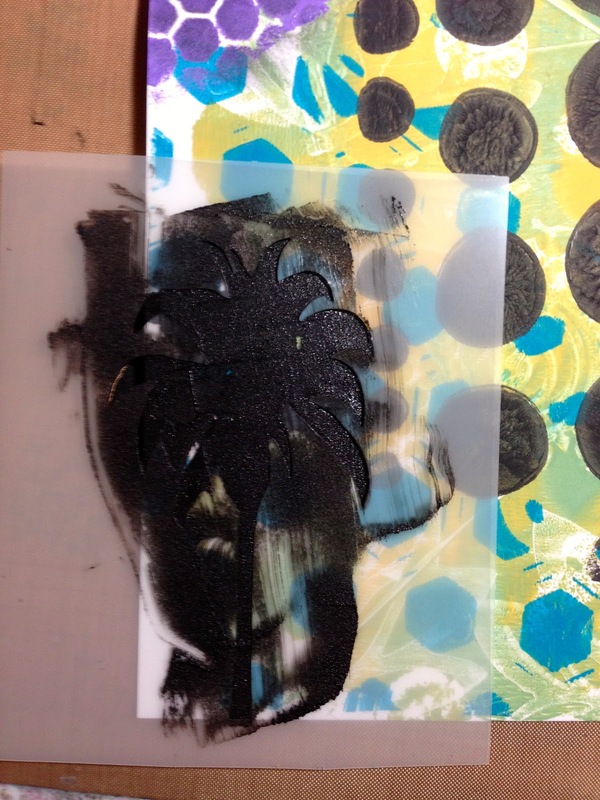 Once the past on my first two flowers were dry, I used a mask and another stencil to create overlapping flowers with the embossing paste. Once everything was dry, I used white gel pen to go around the flowers so they would stand out more. The gel pen was a breeze to write over the paste. The paste took the gel pen SO well. I used my new Stampotique stamp that I just got the other day for the image here. She is called Relaxin and is by the artists Jill Penney and Daniel Torrent. I colored her with Pitt pens and black soot distress stain. 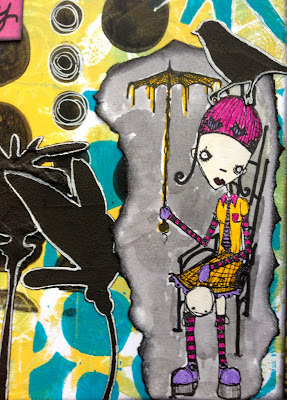 I also added a raven on top of her head with a Wendy Vecchi stencil and the embossing paste. 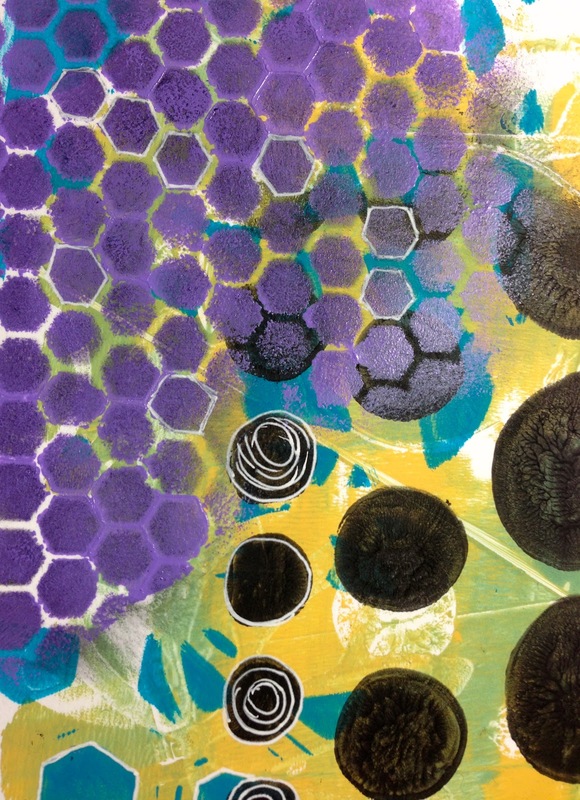 The purple in her shoes and gloves match the color of the stencil I used earlier in the upper corner. I added some doodling here and there and also hand wrote the words. Here is a photo of my finished page. 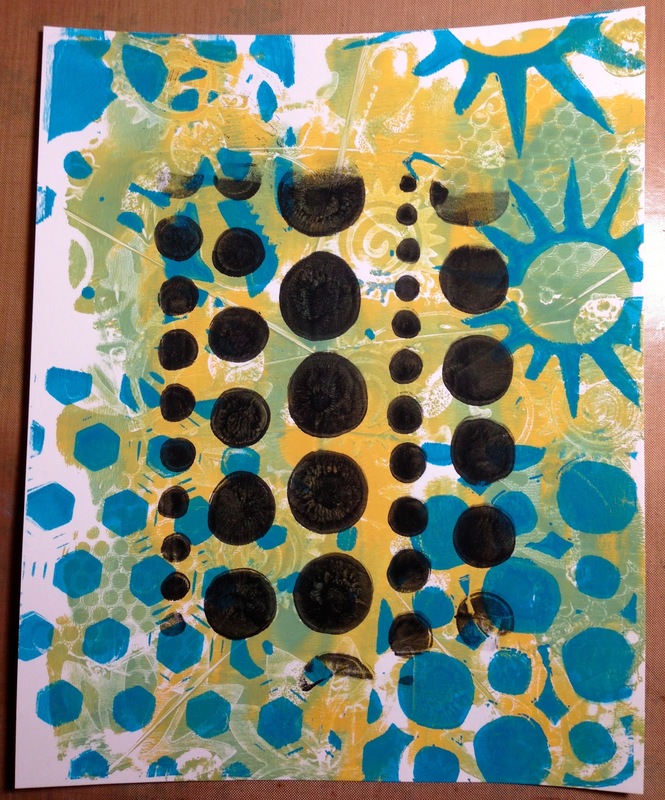 I just love the way the gelli print background works with this page. It's not expected but somehow it works. I love that the flowers aren't traditional flowers too. I hope you have enjoyed the tutorial for today. I would recommend that Wendy Vecchi embossing paste for anyone, it's so great. What a fun and happy creation!!! I love working with Modeling paste but haven't tried Wendy's out yet..it's on my wish list! Oh you have inspired me to pull out my Gelli plate... Your work is wonderful. Thanks for joining us at Stampotique Designer's challenge this week. Looks like you're having fun in your journals! Love the way you used the Stampotique chick. nice job!~~ this looks GREAT! Very fine tutorial, Claudine, and a fun spring page! 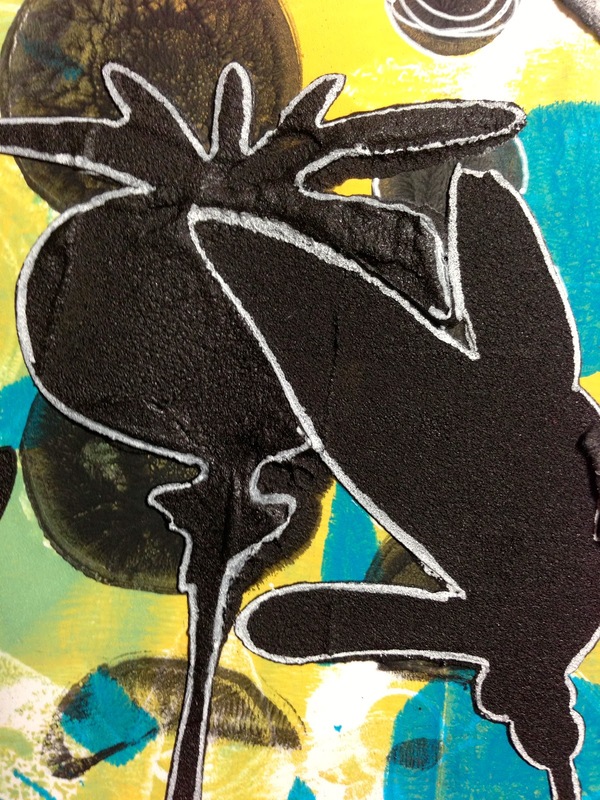 Congrats on being chosen as one of Sarinda's favorites this week! 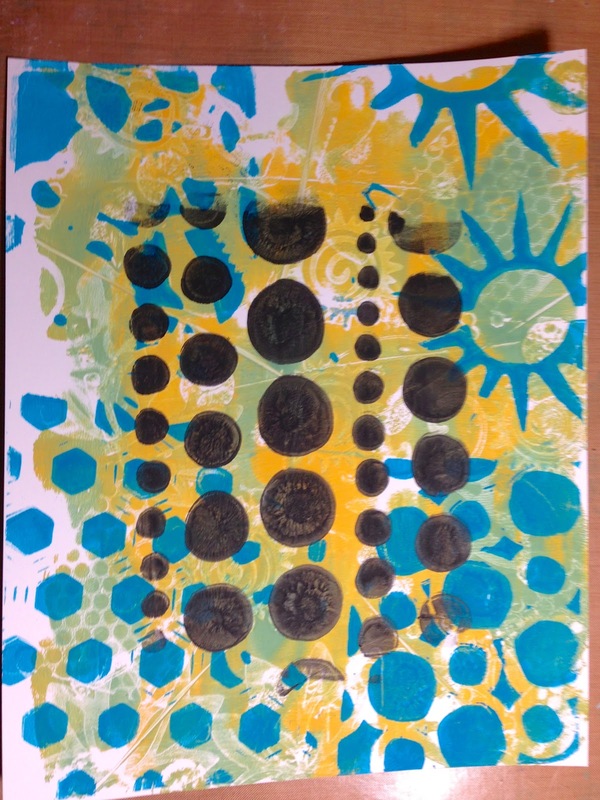 Love that you used the Gelli Plate in this creation...it can become such an inspirational "jumping-off point" in our art! I love all the layers here, too! I love your blog, I love your creations, I love the way you share the stages of the process of your thinking and making art. You're an inspiration. Thank you! 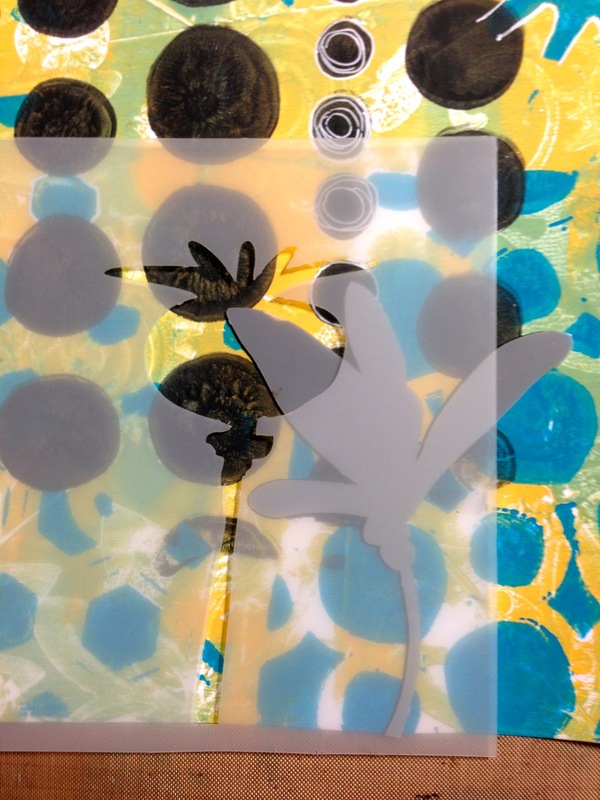 Looking great - wonderful stencils and bold colors! Love this and thanks for talking us through the processes you used. Great use of stencils and all the other goodies.